A handy technology called smartphone has now become a part of human lives. There are few people who are not knowing and using it in the world. For many people, it’s even difficult to think a day or an hour without it. Making a phone call is normal matter. Finding places, taking awesome selfies and pictures, playing favorite songs and making the record of meetings and contact list is all available on the device. 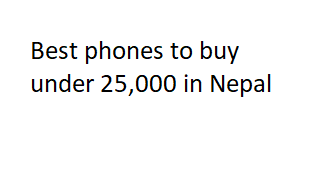 Lots of new phones have arrived in Nepal. Nowadays, Nepalese are crazy about the smartphone that has a long battery life, a humble storage, and best megapixel camera that takes a good pics and videos. Xiaomi Redmi 5 is the phone with a full 5.7 inch IPS LCD with Gorilla Glass protection screen. The phone has a 1.8 GHz Octa-core CPU with a Qualcomm Snapdragon 450 chipset. Movies, pics, and games can be enjoyed in a resolution of �720 × 1440 pixels (@ 282PPI). Inside there’s a storage of 16 or 32 GB, expandable up to 128 GB, Adreno 506 GPU, and Android Nougat (V7.1.2) OS with MIUI 9.1. The front camera is 5 MP and the rear camera is 12 MP with f/2.2 aperture, LED flash. Sensors like Fingerprint (rear mounted), Accelerometer, Gyro, proximity, compass are available. A battery is 3300mAh that comes with a fast charging. A selfie lover should buy this phone as it combines front camera, 20MP f/2.0 aperture lens, LED flash and rear camera, 13 MP f/2.0 �aperture lens, phase detection autofocus, dual-LED flash with a long battery life (Non-removable Li-Ion 4000 mAh). HD display of 5.3 inches (IPS LCD) with a resolution of 1280 ×720 pixels (@282 PPI) is available. It is has a Chipset of MediaTek MT6753, CPU of 1.3 GHz �Octa-core, GPU of Mali-T720MP3, a RAM of 3GB, and an�internal storage of 32GB, microSD up to 128GB (dedicated slot). The phone is protected by the 2.5D curved glass with Corning Gorilla Glass 3 and it runs Android 7.0 Nougat with Amigo 4.0 OS and UI on top. Sensors such as Accelerometer, Gyroscope, Proximity, Compass, Fingerprint are found. Talking about the connectivity, it supports Dual SIM with 4G LTE, Wi-Fi 802.11 b/g/n, Bluetooth 4.1, and GPS. The phone is available in different color: Red, Black, and Gold. Huawei Y7 Pro 2018 is announced in 2018, March. This dual sim phone has a screen size of 5.99 inches. Play multi-touch and latest games as the phone run on Android Oreo (v8.0), Qualcomm MSM8937 Snapdragon 430, octa-core 1.4 GHz Cortex-A53 CPU and Adreno 505 GPU. Internal storage is 32 GB ROM and RAM 3GB and supports dedicated microSD up to 256GB. FM lovers can tune the FM radio. There is a dual primary camera: 13MP + 2MP (phase detection autofocus, LED flash) which takes a pics in Bokeh mode. Camera Features are Geo-tagging, touch focus, face detection, HDR, and panorama. Video can be filmed on [email protected] The secondary is 8 MP with a LED flash. The phone is available in different color variations i.e. Black, Gold, and Blue. This is another phone on our list with a non-removable Li-ion battery of 3000 mAH. The movies and videos lover can enjoy them in an HD plus, resolution of 1440 x 720 pixels @ 268 PPI. Extra features include Wi-Fi 802.11 b/g/n, Bluetooth 4.2, Micro USB 2.0, GPS and sensors such as Accelerometer, Proximity, and Compass. Nokia is a popular brand in a mobile phone industry. Its phone is easy and friendly to use. Now it has launched a new smartphone named Nokia 5. The Nokia 5 has got 5.2 inch IPS LCD with Gorilla Glass protection. Its resolution is HD (1280 × 270 pixels) @ 282 PPI. Enjoy gaming experience in a new environment with a Qualcomm Snapdragon 430 processors, octa-core 1.4 GHz Cortex-A53 CPU, Adreno 505 and 2 Gigs of RAM. The phone is fully updated with the Android v7.1.1 Nougat. The rear camera is 13MP with f/2.0, PDAF Dual-LED (dual-tone) Flash and the front camera is 8MP with f/2.0. Internal Storage of the phone is quite satisfactory. It has 16GB memory space and expandable up to 256GB using SDcard (dedicated slot). Sensors such as Fingerprint (front-mounted), accelerometer, gyro, proximity, and compass is available. Supports MicroUSB 2.0, USB OTG compatible, Wi-Fi a/b/g/n, Bluetooth 4.1, GPS, NFC, and FM radio. It has a non-removable battery of 3000mAh which lasts throughout a day. Sony smartphone is popular for its best camera. The company produces a lot of good camera phones in the market. Sony Xperia XA is also one of them. The front camera is 8MP with Sony IMX219 Exmor R sensor having 88-degree wide-angle lens while the rear camera is 13 MP with 1/3� IMX258 Exmor RS sensor, LED Flash, 1080p video recording. The recorded and captured videos and pics can be viewed in a 5-inch curved glass edge-to-edge display. The phone has an HD resolution, (1280 x 720 pixels) @ 294 PPI. Internal Memory of 16GB, expandable memory up to 200GB using microSD card. Other features include sensors such as Accelerometer, proximity, compass, dual SIM (nano+nano), 4G LTE, WiFi 802.11 a/b/g/ n, Bluetooth 4.1, GPS, and NFC. Front Camera of 5MP, f/2.2 aperture, Screen Flash. Inside is a Qualcomm Snapdragon 450, Octa-core (1.8 GHz Cortex-A53) CPU, Adreno 506 GPU, and Android 8.1 Oreo and Funtouch OS 4.0 OS and UI respectively. The Connectivity feature such as Dual-SIM (Nano), 4G, Wi-Fi b/g/n, Bluetooth 4.2, A-GPS, USB-OTG is available. Enjoy sensors like Accelerometer, Proximity, and Compass. The phone has a Non-removable Li-Ion 3,360mAh battery. Nepalese people are indulging themselves in picking up the phone of their interest and that match their works. It is really a good thing that new technology is being used and it is beneficial to the people from a different perspective. You can also try out the phones such as Xiaomi Redmi Note 4, Xiaomi Redmi 5 Plus and Samsung Galaxy J7 Nxt which are also available under 20k Nepali rupee.